I've seen crochet blankets using the Catherine's wheel and loved them. I've seen crochet throws using the Arrows stitch and thought they were so pretty. I've never seen the 2 stitches combined and am thrilled with how this Traveling Arrows Home Decor Collection has turned out. I think this is one of my favorite designs to look at! What do you think? Do you love the ripples? Does the texture speak to you? Can you picture this in other colors to fit your style? Let me know! Be sure to PIN this on Pinterest to help spread the word. Add it to your favorites on Ravelry & Etsy and share a link to this post so your crochet friends can see it too! 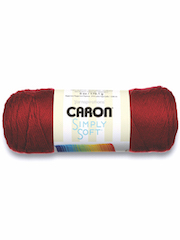 When it comes to soft yarn, Caron� Simply Soft� has no equal. It's perfect to use to make baby blankets, scarves, afghans or any other knit or crochet project that needs medium-weight, soft yarn. We do not guarantee dye lots, but will match lots if possible.